An ancient Roman bath in central Turkey is undergoing archaeological work to open its doors for tourists. The 2000-year-old Basilica Therma was added to the UNESCO World Heritage tentative list this year. 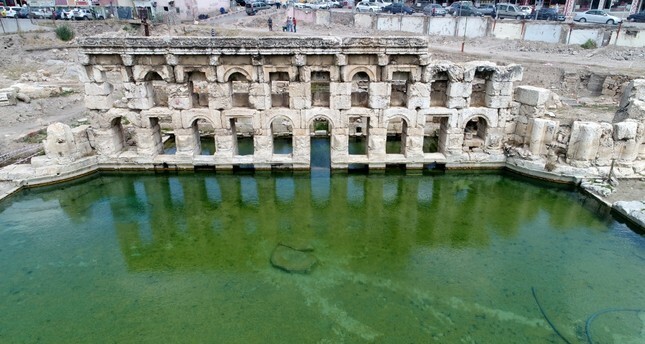 Excavation work at the bath located in the Sarıkaya district of Yozgat province started in 2010, unearthing a semi-Olympic size swimming pool. The area of excavation was expanded in 2014. Speaking to Anadolu Agency (AA), Metin Halıcı, provincial head of the Culture and Tourism Ministry, said that a master plan was prepared to introduce the historical bath to international tourism. Halıcı said that excavation work is carried out in line with this master plan, stating that a symposium will be organized in November to introduce the Roman bath at the national level, while in January one will be organized at the international level. "It was important to us that we were included on the UNESCO tentative list because this will be worldwide promotion," he said. Halıcı said that the promotional activities would pay back in the form of a large number of tourists. "Our promotions are rapidly going on, and we have a new plan to enter the UNESCO World Heritage list," he said. "One of the most prominent features of the bath is that thermal water is still boiling inside. We want to present this historic, ancient thermal welfare center, thermal treatment center to the people," he added. Ömer Açıkel, the mayor of Sakarya, said that the only similar structure is located in Britain with 1.5 million annual visitors. Açıkel said that Yozgat's Roman bath also deserves the same attention; thus, it should be included on the UNESCO List of World Heritage. "We claim that this is the oldest thermal treatment center in the world, even the oldest wellness center in the world," he said. Açıkel said that both health and religious tourism could attract tourists from around the world. The Basilica Therma is believed to have been built after the daughter of a Roman king, who lived in central Kayseri, fell sick. The bath was built to treat her. She was cured through the healing properties of the thermal waters; thus, locals call the bath the "King's daughter." During the excavations between 2010 and 2015, many pieces belonging to Byzantine, Seljuks and Ottoman Imperial periods were unearthed. The largest thermal pool in the Roman bath measures 23.30 x 12.80 meters and has a depth of 1.34 meters. The temperature of the pool water is about 45 degrees Celsius.